HOUSTON (KTRK) -- The weekend storms downed trees and power lines in one north side neighborhood. One homeowner says he and his neighbors can't get any answers about who's responsible for cleaning it all up. 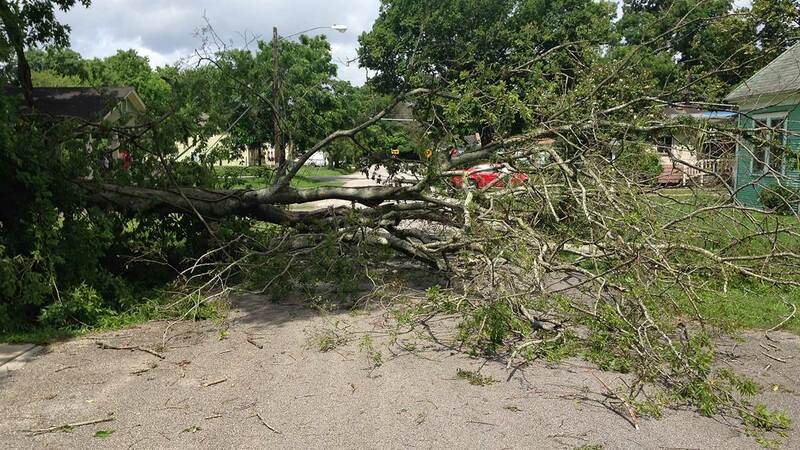 One tree fell and blocked E. 32nd Street in Independence Heights well into Monday evening. That tree took wires down with it. "This happened yesterday morning when the storm came through," says Lawrence Jones. "I called them yesterday morning at 6:15." "They came out yesterday and observed it," Jones tells us. "Then I was like nobody did anything. So I called them again this morning and they came out and observed it today, and then they blamed it on the city of Houston. And of course the city of Houston blamed it on CenterPoint. So I don't know who's going to take care of what. But I know this is a dangerous situation." Jones says Centerpoint told him to treat the wires as if they're live. "I've been keeping my kids in. I've been staying in. My wife has been staying in because of this safety factor right here." He tells Eyewitness News he's frustrated that nobody is taking responsibility for the wires, or the tree in the middle of his street that he fears is an accident waiting to happen. "If somebody comes through here at night, they could hit it and hurt themselves," he worries. We made several calls for the folks on East 32nd Street. CenterPoint says it's a phone line under the tree, and since the tree is in the street, it's the city's problem and not their's. A rep from AT&T tells us one of these lines belongs to them, but there's nothing they can do until whoever is responsible for the tree gets it off the street and off the lines. The city told us shortly after 1:30 Monday afternoon that a crew would be here to check it out. As of news time, they hadn't shown up. "Something has to be done. It's unacceptable," Jones says. Along with the potential dangers here, there's also plenty of potential liability. We spoke with Richard Alderman, the People's Lawyer, and he tells us it's the homeowner's responsibility to clean it up. The tree fell from the yard of a home that's been vacant for some time. Alderman also says it's the city's responsibility to keep the streets clean and safe. So, in his opinion, if someone was injured on East 32nd, the city could potentially be liable.